Seattle Coffee Gear’s fun and candid personality needed a voice on paper, something that people could easily read to discover the right coffee machine for them. As the Content Marketing Specialist, I wrote product reviews, feature articles or how to guides taking into account SEO to drive organic traffic to the website. I designed corresponding email marketing tactics for blog posts, videos, product sales and other promotions to further company sales. Alongside the small marketing team, I brainstormed campaign ideas, new content series and drank lots of coffee. I hit the ground running at Seattle Coffee Gear with a project to renovate the blog, which fully integrated into the website in August 2016. I started part one of the renovation by organizing blog posts with bold photos and eye-catching subheads to improve readability. Part two of the renovation integrated the blog to the website. I worked alongside our developer to create a wireframe, which includes article and product recommendations to increase conversion rate from posts. Seattle Coffee Gear’s bread and butter are their straightforward product reviews. To capture their candid voice, I learned the ins and outs of the machine by testing and approaching each product like a consumer unboxing the product for the first time. For each blog post, I used Moz and Google Analytics to keep up with trending keywords to ensure the best results. To keep myself organized in my day-to-day blogging, I create an editorial calendar to coordinate three to four posts per week. Out of the hundreds of product reviews I wrote, I was bound to find a few favorite products. Check out my product review for my favorite espresso grinder, the Eureka Atom. My most popular blog post, “Espresso vs Coffee Beans: Is There A Difference?” is the #4 landing page for organic traffic to Seattle Coffee Gear. With article suggestions integrated on the website, this post drew more views to recommended blog posts. Overall, with SEO copy and keyword research, I increased consumer pageviews by an average of 6.78% just under 4 months. Here is a column chart illustrating the blog’s growth. 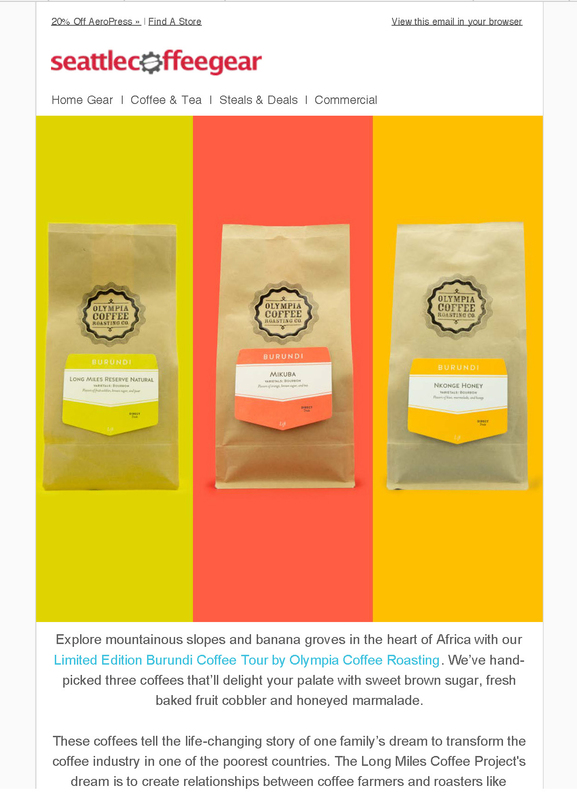 One of my favorite email campaigns was the story behind the Burundi Coffee Tour, three coffees packaged together to tell a tale. Olympia Coffee Roaster’s partnered with The Long Miles Coffee Project, a small American family’s mission to enrich the coffee farmer’s lives in Burundi, to bring us three specialty coffees from their harvest. The Burundi Coffee Tour honors this amazing family and their journey for better coffee.